Due to its complexity, much of the subject matter concerning the economy requires detailed editorial commentary, often supported by relevant tables and graphs. This infographic looks at U.S. rail and rapid transit projects. The tail that is attempting to wag the dog these days is the stock market. With only two weeks remaining in 2018, America’s major stock market indices have moved, at best, sideways versus close-of-year 2017. The Dow Jones Industrial Index (DJI) is currently -0.5% relative to its closing level on December 31 of last year. The S&P 500 is -0.9% and NASDAQ, -2.4%. North of the border, the Toronto Stock Exchange is -9.0% compared with year-end 2017. The FANG stocks have been leading the retreat in equity prices. Since the summer of this year, the share price of Facebook, which has experienced confidentiality problems galore, is -29.2%; Amazon, the retail sector’s ‘disruptor-in-chief’, is -19.9%; Netflix is -34.1%; and Google/Alphabet, -16.2%. Even Apple has moved out of favor, -26.3%. On August 2nd, Apple became the world’s first trillion-dollar company, but of course that valuation no longer stands. The Federal Reserve has been paying attention. Earlier, the Chairman of the Fed was adamant that he wanted to see the federal funds rate return to its ‘equilibrium’ or neutral level of 3.00%. Neutrality is when prevailing interest rates are neither too stimulatory nor too contractionary. The current level of the federal funds rate is in a range of 2.00% to 2.25%. The likelihood is still high there will be another 25 basis-point (where 100 basis points equals 1.00%) increase later in this month of December. The schedule for next year, however, is no longer as firmly established. Fed Chairman, Jerome Powell, has stated that future action on interest rates will be ‘data driven’. By the way, the stock markets also really don’t like the tariff skirmish with China. Whenever there is even a hint of a resolution of that dispute, investors respond ecstatically. The accompanying table records the top 10 project starts in the U.S. for November 2018. 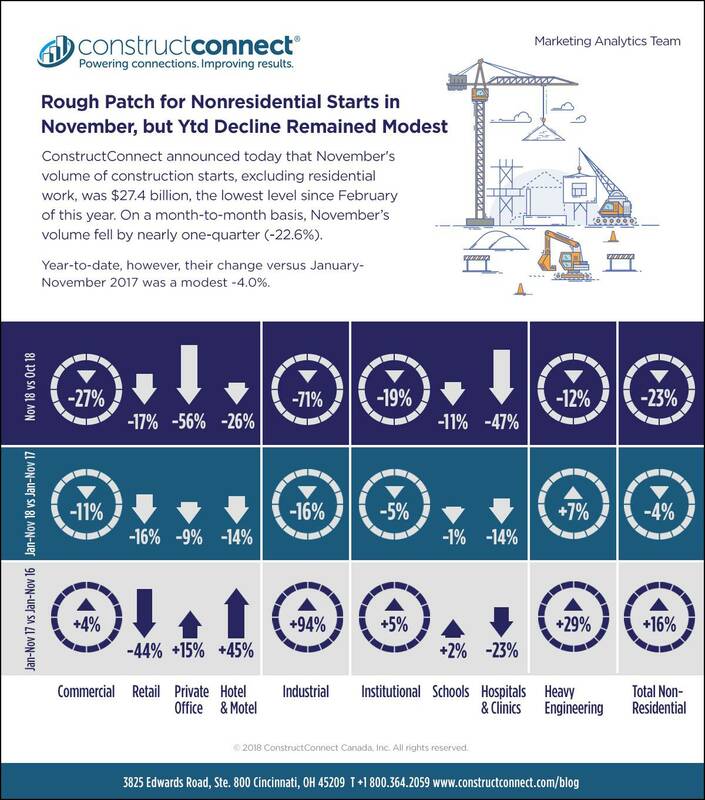 ConstructConnect announced today that November’s volume of construction starts, excluding residential work, was $27.4 billion, the lowest level since February ($26.6 billion) of this year. On a month-to-month basis, November’s nonresidential starts fell by nearly one-quarter (-22.6%). The usual seasonal pullback, due to harsher winter-onset weather, is in a range of -2% to -7%. November 2018 compared with November 2017 was -9.8%. November 2018 relative to the previous five-year average for November, − i.e., from 2013 through 2017, − was +0.9%. Year-to-date starts in 2018 compared with January-to-November of 2017 have been -4.0%. There is only one month still to go, December, before 2018’s annual results will be tabulated. ‘Nonresidential building’ plus ‘engineering/civil’ work accounts for a larger share of total construction than residential activity. The former’s combined proportion of total put-in-place construction in the Census Bureau’s October report was 59%; the latter’s was 41%. There was a dramatic reversal in fortune on the jobs front between the U.S. and Canada in November. It wasn’t that the U.S. number from the Bureau of Labor Statistics (BLS) was so bad. At +155,000, it slowed from +237,000 the month before, but it was still a solid increase. Rather, it was that Canada set a blistering pace. Statistics Canada’s figure of +94,000 jobs was the biggest monthly increase in more than six-and-a-half years, dating back to March 2012 (also +94,000). Canada’s unemployment rate in November improved to 5.6%, the lowest it’s been in more than 40 years. America’s unemployment rate stayed the same in November as in October, but keep in mind that the current level of 3.7% is the tightest in almost 50 years. Canada may have had a better November than the U.S., but for year-to-date 2018, it’s been the latter that has been vastly outperforming the former. U.S. monthly average jobs creation so far this year has been +206,000, +12.7% above last year’s comparable figure of +183,000. Canada’s monthly average jobs bump to date in 2018 has been only +14,000, -58% versus January-November 2017’s climb of +33,000. Tables 1 through 3 accompanying this article detail the latest (October 2018) statistics on construction employment regionally in the U.S. and Canada. Table 1 is a ranking of states, D.C. and Puerto Rico for the U.S. and provinces and territories for Canada by construction employment levels. The latest Employment Situation report from the Bureau of Labor Statistics (BLS) records that the U.S. construction sector’s unemployment rate in October was 3.6%, lower than the national ‘headline’ rate of 3.7% for all jobs in the economy. Since 3.7% as the national jobless level was a nearly 50-year low, for construction to have done even better was an outstanding achievement. Also, for October 2018, the BLS calculated that construction workers’ year-over-year (y/y) wage gains were ‘richer’ than for all jobs (i.e., not just construction, but manufacturing and all manner of services work), both hourly (+4.2% versus +3.2%) and weekly (+4.5% versus +3.2%).